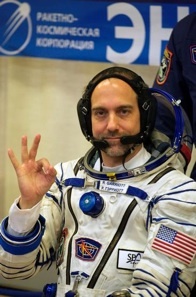 Richard Garriott, a significant figure in the video game industry, recently established himself as a self-funded space tourist, spending ten days onboard the International Space Station (ISS) in October. 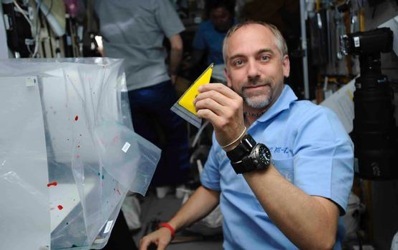 Astronomy Now’s Website Editor Emily Baldwin spoke to Garriott about the highs and lows of his space station experiences, and his thoughts on the future of space tourism. What inspired you to want to take on the challenge of training as an astronaut and to go into space? I think everybody, at some time in their life, imagines they might want to travel into space, so in that way I don’t think I was any different to anyone else. What was different for me is not only was my father an astronaut [Owen Garriott] which made it seem more practical, but also, when I was a teenager, a NASA physician told me I would not be eligible to be a NASA astronaut because of my poor eyesight. For me, instead of making the dream go away, it made me think “wait a minute, you can’t tell me I’m not allowed to go into space” and so I worked ever since then to privatise space and find a way for private citizens to get there, and of course most especially me. How long did you have to train for, and what preparations did you have to make in order to be ready for the trip? My training has been most of 2008, and my training here in Russia has mostly been what you might consider intellectual training. That is, learning all the systems onboard the Soyuz and the Space Station to make sure I could operate safely and independently, as well as practice all the experiments I wanted to do. But even before that I had medical preparations to do, where you have to learn about the physiological challenges of living in space, which are considerably greater than what people might expect. Did you encounter any difficulties with your health that you weren’t expecting? There were some challenges that I didn’t realise in advance how significant they would be. For example, about 80 percent of people who go into space get what is called space adaptation sickness, which a lot of people think of as motion sickness. I actually didn’t have that because the Russians have a very nice preparation scheme for acclimatising yourself to potential motion sickness that helped me. But on the other hand there is another effect that occurs, called a fluid shift, that when you live in zero-g it kind of feels like you’re hanging upside down on monkey bars. And when you hang upside down for say five minutes you can feel the extra fluid pressure in your head but it doesn’t really bother you. But if you can imagine doing that for five hours or five days you can imagine that it can become particularly uncomfortable. And so for the first five days I felt like I had a head cold, and I really didn’t feel too comfortable. Also your stomach and intestines basically shut down when you’re in space and so you feel a little sick and just not really yourself. A lot of people describe those effects as fairly normal when in space. What was your role in the mission? I really had three main areas. One was to prove or demonstrate that as a private astronaut I could still contribute scientifically and commercially like a career astronaut. So I did a variety of experiments and one which was probably the most scientifically interesting was called Protein Crystal Growth where I grew a very large number of protein crystals which are now being studied on the ground and which I believe will contribute significantly to the understanding of this very important science that really stands a good chance of advancing the medical field in a very important way. [The proteins have important cellular functions that are usually associated with common human diseases, and the weightless environment of space allows large crystals to grow, enabling researchers to learn more about their molecular structure and how they can be used to develop drugs to combat disease]. I also spent a good deal of my time doing second generation experiments. Since my father was an astronaut and took photos of the Earth, I worked with a group called the Nature Conservancy to study those NASA photographs to find places I could or should photograph myself from space to showcase how the Earth has changed in 35 years in one generation of space flight. And then there were educational activities. In fact, I spent almost 30 percent of my time on orbit doing educational experiments and answering educational questions. I worked with the British National Space Centre as well as the Challenger centres and did experiments for the teachers and the students. I also connected by ham radio [amateur radio] to students all around the globe. And finally I did what we call 'personal symbolic activities', in particular I did an art show on orbit and I even created a science fiction movie. Garriott used some of his personal time to put on an art show. You also ran a competition for children to design some experiments for you to carry out in space. What were some of the things they came up with? We had a contest with a variety of different age groups. The oldest kids proposed future plans to take advantage of space that weren’t necessarily things I could do in a short duration orbit, but they were designing things like hotels and buildings in orbit that might accommodate larger numbers of people. And for the slightly younger kids they had me doing experiments like what happens in your daily routines, like when you brush your teeth, wash your hair, rinse your mouth out and so on. Basically, how can you rinse your mouth out without a sink to spit into, for example? And so they had me doing some experiments relating to life in space. The very youngest kids asked me very insightful questions that were actually quite tricky to answer, like is it hot or cold in space? Of course space is a vacuum and so as such has no inherent temperature of its own. Its temperature is actually the measure of energy or motion of the molecules of a medium like the surface you might touch. So in space if you’re in a shadow like behind the space station or behind the Earth it can get very cold very quickly as you radiate your heat away, and in the sunlight you absorb that heat and the vacuum around you, which is a great insulator, gets hotter and hotter and you would overheat very quickly. So space really has no temperature but you get cold in the shade and hot in the Sun. How do things ‘work’ on the space station? Life is dependant on a number of things onboard the station. For example you have to have electrical power – there are giant solar panels all over it, giant batteries in some of the main areas of the station, and yet what’s interesting is that there’s no voltmeter because it’s all managed from the ground, so it just works and some people on the ground keep an eye on it so you don’t have to. Another thing that’s really important is having enough oxygen. There’s a system that works through electrolysis, these water tanks get brought up and get split into hydrogen and oxygen, and the hydrogen is vented outside and oxygen is brought into the main cabin, but there’s no oxygen gauge. Another thing that’s really important is to get rid of the carbon dioxide, but there’s no carbon dioxide gauge! All these things you can find – you can go to a laptop and bring it up and look at the displays but there’s no really obvious in front of you gauge. Same with temperature – there’s no thermostat on the air conditioning system for example. The systems are incredibly well designed, they just operate themselves, and they’re monitored by the ground and it’s only in the very extreme conditions do they notify the crew and say “hey, there’s something you might need to take a look at.” Otherwise it just works. For example on the few days I spent on Soyuz, it’s designed astoundingly well such that you don’t have to turn on air conditioning or heating, it just works by itself. It’s insulated well enough that it retains its own temperature. Any excess heat is automatically dumped through radiators and you’ve got little heaters that are also operating to make sure things don’t get too cold. And it all just operates automatically without any human interaction. What was it like when the toilet broke? Actually they had cured the toilet by the time I got onboard. However, you hear that the most common question kids ask is how do you go to the bathroom in space? But having not been an astronaut before, when I got over here [to Russia] one of the questions I had is how do you go to the bathroom in space? It’s funny, because even amongst astronauts and cosmonauts, one of the most common dinner time conversations is using the bathroom and what parts are easy and what parts are difficult. Liquid collection is really no problem, it’s basically a funnel with a vacuum behind it that you pee into, and the only challenge is how to keep yourself floating away while you’re trying to hold the funnel in front of you. Technically a little challenging but it’s no big deal. On the other hand, dealing with the solid waste is quite a bit more challenging. The method is still basically the same, but you sit on a miniature toilet which is lined with a plastic bag with perforations on the bottom, and there’s a fan below that is there to pull things into the bag. However it doesn’t really work that well, it doesn’t respond in the same way that gravity assists you in getting rid of solid wastes on the Earth. So that is an area that requires additional strategies! 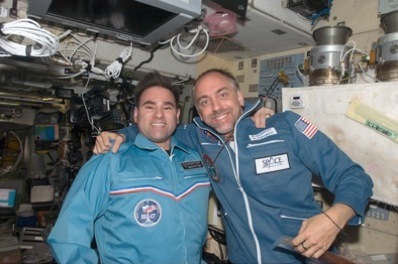 NASA astronaut Greg Chamitoff (left) and Richard Garriott pose for a photo in the Zvezda Service Module of the International Space Station. Image: NASA. One was the San Francisco bay area. One of the things that was really striking was still how close to the Earth we were in spite of being as high up as we were [the ISS orbits at an altitude of about 350 kilometres]. As you look to the horizon you can see the blackness of space and the curvature of the Earth, and the thin veil of the atmosphere on top of the Earth, but looking straight down you can still see airports, air plane contrails, the clouds, I could still see all the ship wakes going in and out of the Bay area, I could see the Golden Gate Bridge and the Oakland Bay Bridge, all easily viewable from space. It was interesting to realise how still intimately close you were with the Earth. And you hear how man made objects are difficult to see from space, – at least from low Earth orbit that’s just not true. You can see the Palm islands in Dubai and the New World Islands very easily by eye. You see weather systems in a completely different way because you could see that from horizon to horizon they interact with each other in ways you would not see from the ground. Also you can see the geological interaction of the planet, like plate tectonic movement, – it really does appear like one continuous flowing surface of the Earth. And even how humanity has pretty much inhabited all the fertile areas of the Earth is really quite apparent from viewing it from space. Well, we ignored bed time but apart from that we had a pretty good schedule! We would get up at 5am GMT, we’d spend an hour and a half having breakfast and doing morning hygiene routines and printing out our daily schedule and preparing for work. At 6.30 or 7am we’d start our work day and everyone had independent schedules. The work days were quite full, but we all got together for lunch and dinner, and after dinner was largely our own to do our personal projects which tended to run until midnight or 1am. And then you get a bit of rest before starting again a few hours later! What were the highs and lows of your trip? A low point would be on flight day 5 I woke up with a horrific headache that lasted the whole day. There was some debate as to what the cause was but one possibly is that because you sleep in a sleeping bag, and for at least a little bit of the time in that particular night I’d brought my face into the sleeping bag which tends to mean you breathe in and out the same air, so basically I had carbon dioxide poisoning. So I felt really poorly that day. The highlight would probably be my ham radio activities. I talked to over 500 individuals around the globe and had about a dozen contacts with school groups to answer questions. I was also sending lots of slow scan television images down by ham radio and it became very clear early on that people all around the globe were really paying pretty close attention to my flight and observing all the ham radio images I sent down, and were making commentary to me about the images, or how much they were enjoying following along, and getting the chance to talk with me. And I was really very, very moved, especially in the last few days when I spoke to classrooms full of kids, who’d only be online for 30 seconds and would all say “Hi Richard, bye Richard, have a good trip home,” all together. It was really very, very special. What were launch and re-entry like? The launch and re-entry of course are both very special times, just like living on the Space Station itself. Launch is very smooth, it doesn’t feel dangerous in any way and it doesn’t overload your body too much. The g-forces went up to about 4.5g but you don’t feel uncomfortable in any way, you just feel like it’s eight minutes of very confident lifting from behind, lifting into the sky by this amazing vehicle that doesn’t shudder or shake or give any indication of the astounding difficulty of reaching space. Re-entry again feels much more confident and comfortable than I expected but the view is really spectacular. When you’re coming in through the upper atmosphere and seeing the heat shield burn off and the plasma outside the window, it’s really astounding. And when the main parachutes open, the whole vehicle is like it’s on the end of very big whip that gets cracked; you get rolled around with some significant jostling, and after that you’re just drifting down quite comfortably under a canopy until you get down to the ground. The vehicle hitting the ground is like a 30mph car crash, but what’s interesting is that you’re in a seat that’s perfectly moulded to your body and it has shock absorbers, so landing’s actually really comfortable. But the vehicle around you takes a significant impact, but really it’s not particularly alarming, it’s just noticeable. Weather systems can be seen in a totally different way from 380 kilometres above the ground! 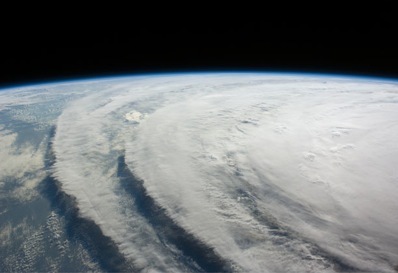 This is Hurricane Ike, taken by crew onboard the ISS in September. Image: NASA. How do you think space tourism will be developed in the future, and could we eventually be making trips into space as regularly as 'normal' destination holidays? The more I’ve learnt about this the more I can break space travel into a few categories. So first there is sub orbital spaceflight which is going to become commercial in the next few years. I believe the ultimate price for those flights will come down to into the tens of thousands of dollars. Which means if you can afford a first class ticket for a vacation across the other side of the planet, you’ll be able to afford instead a flight to space, so a lot of people will be able to take sub orbital space flights. However, the speeds and energies involved to get all the way into orbit and back are considerably more daunting so I don’t think that that’s going to become cheaper than millions of dollars any time soon. So therefore it will either stay in the hands of wealthy individuals, or what I hope happens and this is what I’m hoping to work towards, is that I can demonstrate that there are things to do in orbit that are worth putting people there for, and not because they are sponsored by the government. For example, we spend a lot of money putting someone on an oil rig to bring back oil because oil’s worth it. And as soon as there’s things to do in space that are worth doing then that will take a lot of people into space, not just as vacation but for people to live and work. What advice would you give a school age student wanting to become an astronaut? I would say, to either go privately or to go as a government sponsored professional, the advice is pretty similar. One of the things that made this appropriate for me, in the sense that it allowed me to train and work as a crew member and being accepted as a private flyer by my crew, is that I have a very diverse background. I enjoy subject matter across the board from science to history to math, and that really has been helpful in making my journey successful. That also happens to be important if you want to apply for a job as an astronaut, and it happens to be important if you want to be a successful entrepreneur, which allowed me to afford myself this opportunity to go into space. So for kids, enjoy your classes, enjoy as many different areas of knowledge that you can, pick up as much as you can in as many fields of knowledge as possible. Find something to do that you really love. I’m really lucky I’m doing computer games in my case, which I’m really passionate about and really love, and when you know a subject well enough and are passionate enough about it, you do well at it, and so I think that’s what helped me be successful in this industry and ultimately has taken me into space. Do you have any plans to make further trips into space? Of course I do hope I do get to come back, but I believe it will most likely be when I can put a business plan together, so to speak, that will pay for my trip to space rather than coming out of my own pocket. It will be a few years, but as soon as possible.